My third blogiversary was actually January 29th but I have been so busy the giveaway had to wait. I have so much I want to share but between the kids and other responsibilities there just isn't enough time in the day. I'll get it all out eventually! the bike isn't part of the giveaway. I just like this bike so much I couldn't resist using it as a prop! I wish I could ride this bike all over town and fill the basket with goodies. Alas, Charlotte is a not a biking friendly city. I know my last giveaway was a tote bag but I have since changed the way I was making them and wanted to give away a 'new and improved' tote bag. The new tote has a black vinyl bottom that gives the bag a nice weight and structure and makes it more durable. The rest of the bag is made with a medium weight canvas. The cheery + colorful print is from IKEA and is lined with a white canvas. There are two exterior pockets and two small interior pockets. As always, thank you, to all of you that read my blog. I know I am 'small potatoes' and I dont blog often enough but I appreciate all of you that take the time to read and comment! To enter the giveaway you only need to comment on this post-- please include an email address if you don't have one linked to your account. No liking or other hoops to jump through! One entry per person, please. If you accidentally leave more than one comment please go back and delete the extra(s). Thank you and good luck! I love that bag! And that ring is gorgeous! Thanks for the chance to win! I love the bag and have enjoyed perusing your fun ideas over the years. Happy 3 years! Your blog is great and I love your style! I love the tote & would love to call it mine. Happy Blogiversary & thanks for the giveaway. Happy Anniversary! I love those braided bracelets. Congratulations!!! Very exciting. Your giveaway is lovely! Thank you. I love the colorful tote. Perfect for the library. We need a bigger more durable one and this would be perfect. Thanks for the giveaway! Wow... I love everything! Happy Anniversary! I guess I've been reading for at least a year now and I have to say I love your site because I love your style & eye for things... something that doesn't come naturally to me, so I desperately need inspiration!! I love the bag! 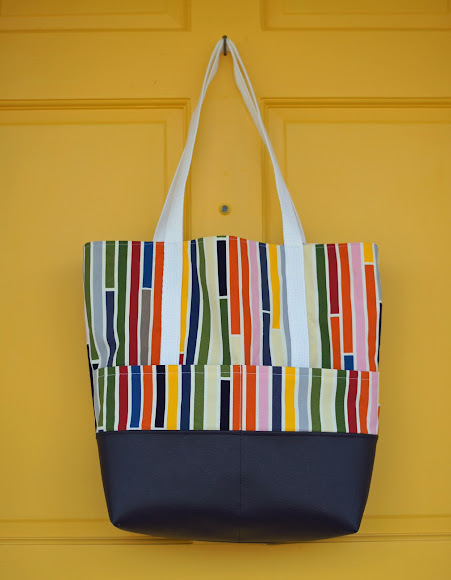 Our diaper bag is starting to fall apart and your cute tote would be a wonderfully fun replacement. I really enjoy reading about your fun projects and ideas...thanks for the inspiration! I'm in love with that ring. And the nailpolish color! Fun giveaway. Love your blog, especially the recipes! happy blogiversary! what a great giveaway! What an adorable bag! I think it and the fun goodies inside are a very generous gift. BTW the bike was a super great thrifty find. Happy blogiversary! Your blog is amazing, it's actually the first blog I started following. Thanks for always sharing your awesome finds and creations, they always help get my creative juices flowing! Funny, I didn't realize I'd been following you for nearly two years!! You are fabulous and I love your ideas (have copied a couple). Happy Blogiversary. Blogging wouldn't be the same without you. I really want that bag even if the bike doesn't come with it. Happy 3rd Blogiversary! How sweet of you to give such a great gift to someone else!! Thanks for blogging and sharing what you do! I'm grateful to count you as a friend. Happy Blogiversary! You may not blog every day, but when you do, it's quality. Thanks for inspiring me to make stuff! I love the fabric of the bag. I'm not sure how I stumbled upon it but I love following your blog. You make the best totes! I'd love to win one. i would love this adorable bag-o-goodies! love you! I think I started following your blog when once upon a time katiedid had you linked on her blog. I always read your blog and feel inspired to create...but then I remember how much I just want to take a nap. Don't know how you do it all! jenwrathall at gmail. How fun! Thanks for the contest! Fabulous bag! and Love the ring! Very cute, thanks for the chance! So cute Erin! Love the goodies too! i always enjoy reading you blog. know you are extra busy with your family but appreciate your posts. God bless. Happy Blogiversary! Thanks for blogging. I really enjoy your posts! happy blogiversary! that bike is super adorable and i'm loving the bag. Love the bag and enjoy reading your blog! Congratulations on three years of wonderful blogging! Fun bag!enjoy your blog,keep it real. Love your blog and would love to have that bag! Congrats on your third blogiversary! What a fabulous bag!I love the black bottom with the bright colours. Thanks for the great giveaway! Happy anniversary! It's been fun getting to know you. I've followed your blog for about 2 1/2 years. The first thing that got me hooked was the repurposed entertainment center to a kitchen. Congrats on a great blog for 3 years! Happy Blogiversary! I love reading your blog - lots of great project-inspiration!! very cool giveaway! i, too, wish charlotte were more ride-able! i miss that about asheville! What a fun giveway...the bag is great and I love that color polish. Congrats on your blogiversary...l always love to see your projects. What a nice giveaway! Happy Blogiversary! HAPPY BELATED BLOGIVERSARY! Can't remember how I stumlbed onto this blog but I'm loving it! May God continue to bless your ideas and hands. I enjoy reading your blog- you always have such neat sewing tutorials and your thrifting finds are amazing! Thanks! want it all! love reading about your thrift finds!! I love, love, LOVE your blog. We share an obsession for pumpkin and I've made a lot of your recipes. You've also inspired me to get back into thrifting, which I scored big time last week....brand-new hard cover children's books for a buck! You are so talented and I would love anything you created. You inspire me! LOVE your blog and happy blogiversary to you! Happy Blogiversary! I love the tote, I could totally see it crammed full of library books - for some reason I am lacking a dedicated library tote for the kids and I. I just can't commit. As always, you have some super cute stuff going on over there!! LOVE the ring! Would love to win your cute creation, Erin! Plus the treats tucked inside are so, so darling. Happy Blogiversary to you! xo. LOVE this bag! It would be perfect for my new teaching position!!! Congrats on the blogiversary! Thanks for the great giveaway! I enoy reading your blog so much and have even followed a few of your tutorials! You are great! Keep up the great work...you are no small potato! Happy bloggiversary! I love all your tutorials, keep up the great work! Happy blogiversary! That tote is awesome! What a fantastic giveaway. Happy Blogiversary! Happy anniversary! I love the leather bracelet; I remember making those at summer camp! Happy blogiversary! I like your potatoes just fine, 'small' or not! Love the bag! Happy Blogiversary!! Congratulations! this would be a total treat, your sewing is beautiful! Happy blogiversary! I love the tote bag. The colors are so cheerful! Happy blogiversary! That print is amazing....thanks for the giveaway! Oh yay! Happy blogiversary! I love the the tote bag and the beautiful handmade jewelry. I'm excited! I stumbled across your blog a few months ago and have been back daily! Thank you for your bits of wisdom and cleverness...I love it! You never cease to amaze me with your endless talent! Great giveaway- and Happy Blogiversary! cute! i bought some of that ikea fabric for pillow covers! Love all of your creative ideas! I really enjoy your blog...even if it is small potatoes it is still a good one!! Happy Blogiversary! I love your bike too, I'd use it for a prop too, if I owned it! I've been coveting and hoping for some Essie nailpolish. Please pick me! That tote bag is so cute! And I loveLOVElove anything with hazelnut also. Mmm. Love everything you made, as always! I been a fan of yours for about 2 years now, and I check in often to your blog! You are quite the inspiration!!!! Love the tote and love your blog! Luv the giveaway. I always enjoy your blog. The tote bag looks great! Was the vinyl hard to sew? I think I'd be too intimidated to try it. Happy Anniversary! I hope I'm not too late to enter! YAy for 3 years!! That's awesome :) I've followed your blog off and on (I kept forgetting to bookmark it) but now that it's saved - I can check in often for all you neat thrifty finds! For the record, I would never think of you as "small potatoes." (And I doubt any of your other readers would either.) You have such a lovely aesthetic and always make such beautiful things as part of what seems a beautiful life. Congrats on three years!!! Thanks for the giveaway! I love reading your blog because I love your thrifty finds and I have a love for most all things vintage and anything mid-century! Keep up the good work! Small poatoes are still nice potaoes. Is Australia too far away to enter?